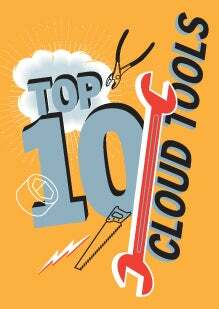 We surveyed cloud practitioners and came up with this list of the most useful cloud tools. Here are their top 10 picks. Cloudability is a financial management tool for monitoring and analyzing all cloud expenses across an organization. It aggregates expenditures into reports, helps identify opportunities for reducing costs, offers budget alerts and recommendations via SMS and email, and provides APIs for connecting cloud billing and usage data to any business or financial system. The company in February announced that it currently monitors over $250 million in cloud costs, which is double what it monitored less than six months ago. These tools are designed to help corporate IT from over-buying Amazon cloud resources. Cloudyn's suite of services gives users a dashboard showing detailed information on all of their virtual machine instances, databases and storage. Cloudyn then provides insights into inefficiencies and suggestions on how to get rid of them. Currently focused on Amazon's cloud, the company has stated in the past that it will work on tools that track usage in Rackspace, Microsoft Azure and GoGrid in the future. AtomSphere is a cloud-based software Platform as a Service used by customers that want to integrate their various cloud-based applications with each other and with on-premise applications. New functionality provided as part of an upgrade last summer allows usage of multiple data sources and reservation of cloud resources for real-time data transfer in integration processes. The company announced in February that the AtomSphere platform is now handling more than a million integration processes per day. That number is 250% higher than it was a year ago. Enstratius provides cross-platform cloud infrastructure management for public, private and hybrid clouds that can be closely aligned with an enterprise's governance and security requirements. Features include self-service provisioning/de-provisioning of cloud resources; multi-currency cost/chargeback tracking; customizable role-based access controls; single login to manage all cloud resources; and, support for enterprise authentication systems including SAML 2.0 and OpenID. Enstratius also supports integration with management tools and the orchestration of configuration management tools such as Chef and Puppet across clouds; automated encryption of all cloud data in transit and at rest with all keys stored outside of the cloud and full application automation including auto-scaling, auto-recovery, cloud bursting. The list of Enstratius' supported clouds is growing considerably and currently most of the big names, including Amazon Web Services, OpenStack-based clouds, Google, HP Cloud Services, Rackspace, Microsoft Windows Azure and IBM SmartCloud Enterprise. Informatica - a long-time data integration vendor - this month will roll out its next generation suite of cloud integration tools (which are delivered as a platform as a service) that include enhancements that address data security issues in the cloud and help enterprise IT manage data integration issues in hybrid cloud deployments. The new Informatica Cloud Data Masking service reduces the risk of data breaches during application development and testing. And the new Informatica Cloud Extend workflow service is geared toward business process creation and management in the cloud. The upgrade from the company's 2012 Winter version also delivers new security and administration features that support broader cloud integration deployments and strengthen IT governance and control. These include hybrid security options for storing connection credentials - (e.g., username, password, security token, etc.) on-premise, behind the firewall or in the cloud; and organization-level blackouts that give administrators the ability to define blackout periods during which no integration, replication or data quality jobs will run, thus strengthening IT control and simplifying the management of upgrades. Delivered as a packaged integration experience, CloudHub and Mule ESB are built on open source technology to provide quick, reliable application integration without vendor lock-in. The company offers CloudHub, a cloud-based integration platform as a service (iPaaS) for connecting SaaS, cloud and on-premise applications and APIs; and, Mule ESB, an open source enterprise service bus for connecting enterprise applications on-premise and to the cloud. The company claims it is currently supporting billions of transactions per day, used in production by thousands of enterprises, including Walmart, MasterCard, Nokia, Nestle and Honeywell. Additionally, MuleSoft enables integrations with leading SaaS vendors such as Salesforce.com, NetSuite, Workday, Intuit and Metanga. Chef is an open source Ruby-based configuration management product served up by Opscode under the Apache license. Hosted Chef (and its private cloud sibling, Private Chef) lets cloud system administrators programmatically configure virtual systems, thereby cutting down on repetitive, manual operations. Chef - which, as the name might allude, uses culinary terms as metaphors to organize its processes - mainly homes on the tasks of provisioning, configuring and integrating cloud resources. Opscode in February released a completely rewritten version of Chef which the company says offers unparalleled scalability. Puppet Enterprise is IT automation software that gives system administrators the power to easily automate repetitive tasks, quickly deploy critical applications, and proactively manage infrastructure changes, on-premise or in the cloud. The product can automate tasks at any stage of the IT infrastructure life cycle, including provisioning, discovery, operating system and application configuration management, build and release management, patch management and infrastructure audit and compliance. Some of the newer features of Puppet include enabling system administrators to view and respond to requests graphically; support for the use of third-party authentication services such as LDAP, Active Directory or Google Apps Directory; and, support for Microsoft Windows. PuppetLabs customers include 24/7 Real Media, Harvard and Google. And VMware earlier this year made a $30 million investment in the company. Formed in 2006, RightScale was one of the first companies to address cross-platform cloud management. Its platform lets organizations easily deploy and manage business-critical applications across public, private and hybrid clouds. RightScale provides configuration, monitoring, automation, and governance of cloud computing infrastructure and applications. RightScale recently released the newest additions to its customer list which include Caltech, Care Innovations (an Intel-GE company), Citrix Online, Conde Nast, Coty, Equinix, Fox Digital Media, Inmobi, JWT, Leo Burnett, Softbank Technology, Telepictures Productions (a Warner Bros. Entertainment Company), Tibco and Zurich Insurance. The Agility Platform provides a single, integrated control point for governance, compliance and security across an enterprise's cloud applications and cloud environments. The platform comprises an extensible policy engine enabling the creation and enforcement of an impressive range of custom governance, compliance and security policies. It provides an end-to-end security model spanning network, instance, data, and access levels including federated identity management. It includes an orchestration engine for deploying complex, multi-tier business applications across heterogeneous private and public clouds. And it has an integrated event bus, a cloud adapter SDK, and workflow automation capabilities to extend cloud operating model capabilities to existing IT ecosystems.